If you have been following my blog you likely heard mention of Finnegan the Labradoodle who is an important part of our family. Finn, as we often refer to him, is friendly and energetic sweet curly mop of a hound. We got him from another labradoodle loving family almost four years ago… and we were fortunate to have the pick of the litter. 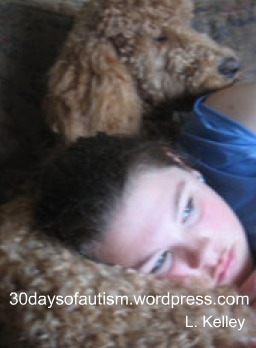 I think perhaps they let us have first choice because they know how carefully we were trying to match our family to the right dog, and they understood the trickiness and importance of this as they also have children on the autism spectrum. H first held Finnegan when he was 2 weeks old. It was love at first sight… H said he looked like a little sausage. Finn was able to come to our house for little visits before he was weened… and we were able to visit the puppies as well. This helped with the transition for both the new pup and for H (and the rest of us too). 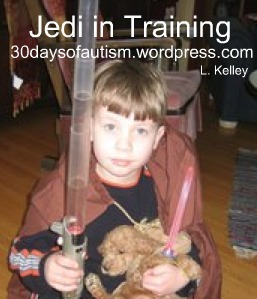 Transitions are challenging for children with autism. In my experience this is part of a resistance to change or unpredictability that arises from being so bombarded by the unevenness of life. 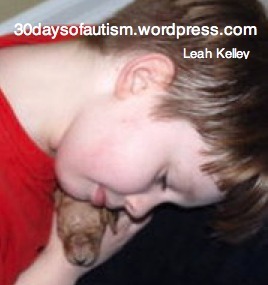 The world comes at my child unevenly – and his response can seem uneven as well. It is not surprising to me that he would often like the things he knows well or is expecting… to remain the same – it is his way or reining in the world. When the dog finally came home he was instantly loved by the whole family. H told us “Finnegan loves Star Wars just like me… so now I know we are brothers…” He took a Jedi cape off of one of his robots and shared it with the puppy. 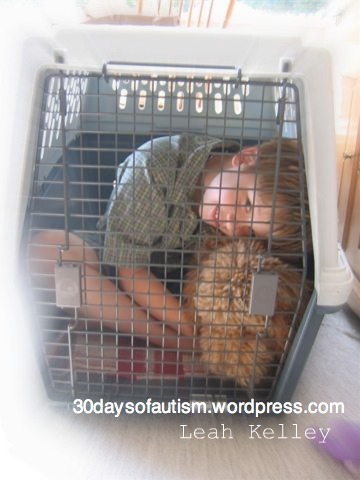 One of our reasons for getting a dog was to help our child feel like he had a non-judgmental companion that would be at his side through his teen years. We anticipated that the middle years would be a difficult time for H as the social interactions with his peers became more sophisticated and his struggles became more apparent to them. We also suspected that working with training the dog would provide excellent opportunities for working to understand the perspective of another and expand his skills with this. Tomorrow I plan to work with H to put together a wee Finnegan photo album and we will revisit stories and memories about our dog and our adventures and escapades together with him. This little exercise will assist H in further developing Epiosodic Me mory. Difficulty with Episodic Memory, the sense of self, story, or autobiography that we use to revisit past experiences, is commonly considered one of the core challenges of autism. 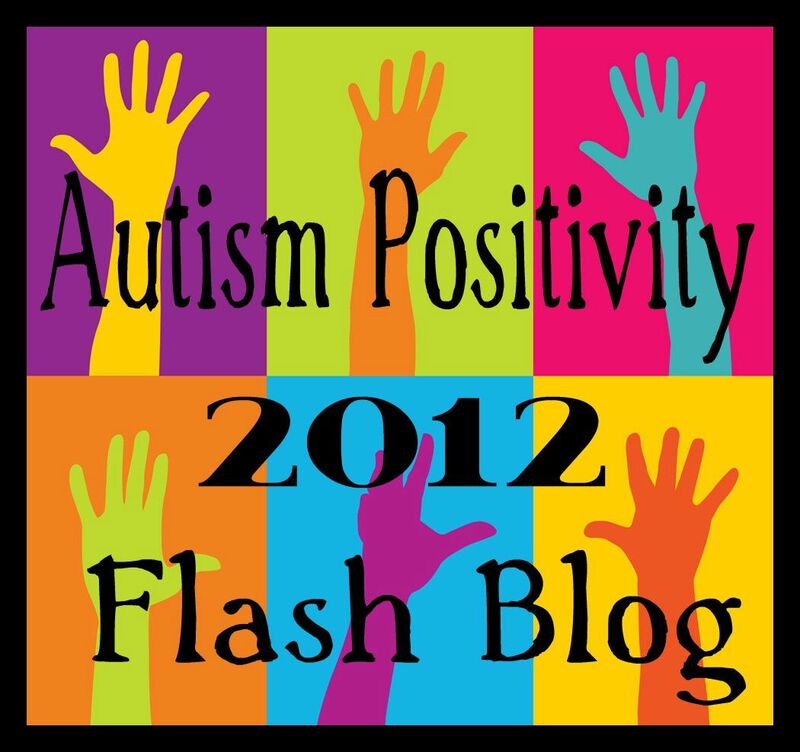 Journaling, creating albums, and story-telling are some of the tools we use to assist H in developing this. The other activity I have planned is to make some dog treats for Finn. I found a recipe for this over at a blog called Dropped Stitches and was kindly given permission to share it here. It will be good for H to get some practice in the kitchen and to be using his perspective taking skills in thinking about how our dog will feel about getting the special treatment. I am thinking about that too – He is really a calming therapy dog for all of us. I am grateful for that bubble chasing sweet dog and the comfort he brings to our world. The opportunities for learning and building relationships and connections are huge… and now, too, I know what to do with all those bananas in the freezer. Dogs love peanut butter. We all know that. Peanut butter has a lot of fat. We know that too. So how about using banana for your “oil” to avoid adding more fat? We all need to do what we can to keep our buddies svelte and gorgeous while at the same time letting them know what good pals they are. 1. Melt peanut butter in the microwave to make it more manageable. 2. Add bananas, water, and eggs and mix well. 3. Add flour, 1 cup at a time, and mix well. 4. Turn out batter onto a well greased cookie sheet and spread evenly. 5. Bake at 350F for 30 minutes. 6. Remove from oven and cut into 1″ x 1″ squares. 7. Return to oven and bake an additional 15 minutes. 8. Turn off oven and leave treats in it for an additional hour and a half. 9. Take the dogs to peanut butter nirvana. With my cookie sheet I ended up with 144 treats. 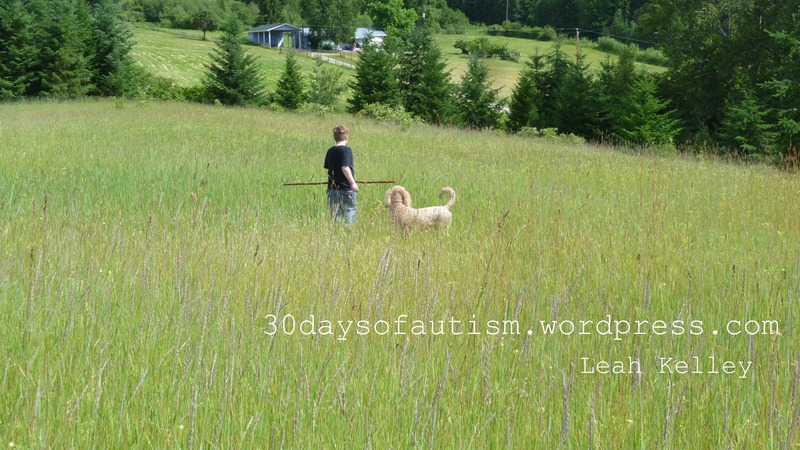 This entry was posted in Aspergers, Autism, Big sister, Episodic Memory and tagged calming, Dog treats, Episodic Memory, handling change, Labradoodle, Perspectives, Puppy, therapy dog, tom-theory-of-mind. Bookmark the permalink. Am excited to learn how this turns out. When I practiced medicine I saw many children with autism and it is heartwarming to see H bonding so closely with your Finn. So many children I saw were so locked inside of themselves; it is wonderful that H has Finn. I hope the treats work out for you, they are a huge success with our dogs. That’s really sweet. I wish you all the best with the adventure but it seems like you are already off to a good start. So – we finally made these cookies for Finn yesterday. It was straight forward and relatively easy and H could do much of it by himself. Because I copied the recipe, increasing the font size and losing the italics, into a doc, H was able to read the recipe and make sure we were staying on track. He also got to practice measuring, cooking safety, using the oven, setting the timer, co-regulation, coordinated action, planning and using executive function, and a whole slew of other skills. This was a really awesome cooking project to do with H and I am not at all exaggerating when I share that Finnegan loves LOVES the treats. What a great way to reinforce thinking about others and do something nice for our sweet and patient houndy!